Published Oct 19, 2017 By Julia 18 CommentsThis post may contain affiliate links. 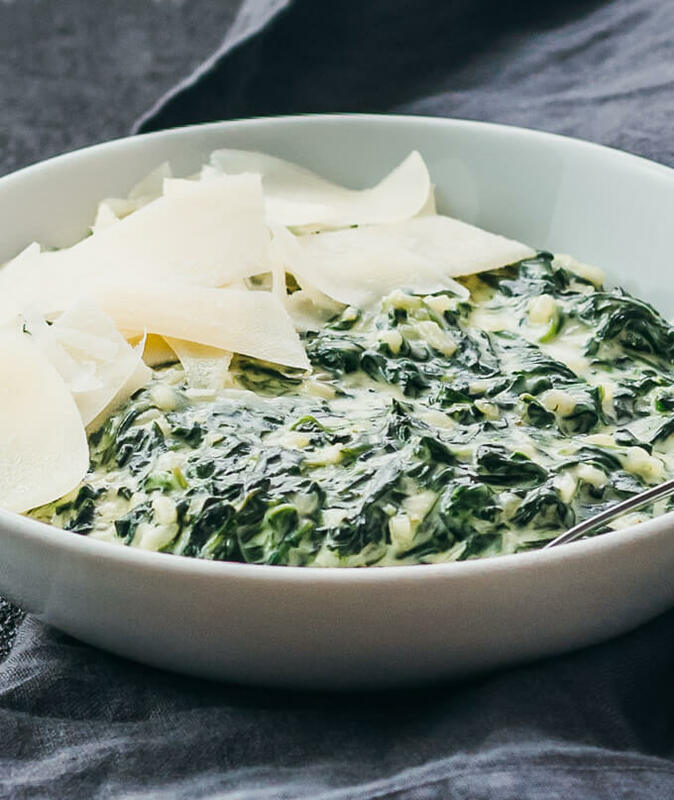 Enjoy this delicious and simple side dish of cheesy creamed spinach. It’s great for low carbohydrate and ketogenic diets. I love fantastic side dishes like this comforting and healthy creamed spinach. They’re a great pairing for steak or any meat-heavy main entrees such as lemon caper chicken, cashew chicken, or beef and cabbage stir fry. Creamed spinach is also an excellent side dish for upcoming holidays like Thanksgiving and Christmas. 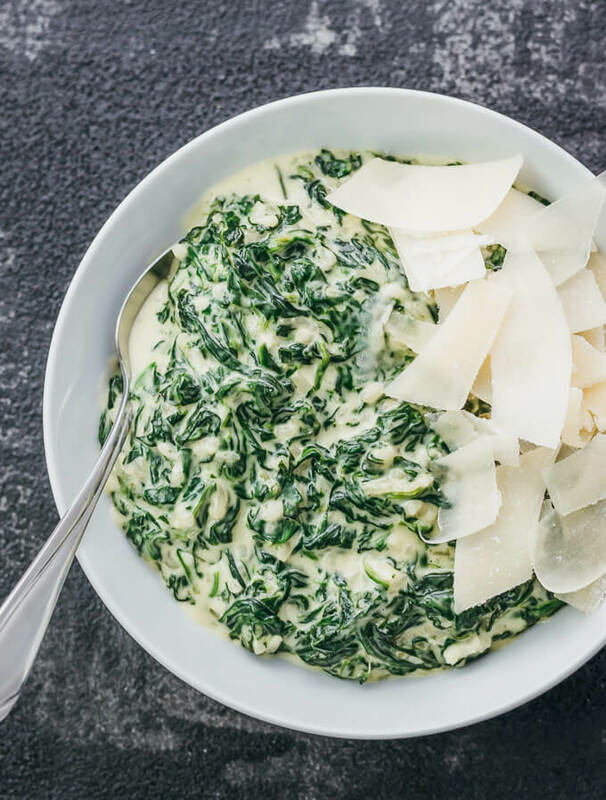 My version is made without cream cheese, and simply incorporates grated parmesan cheese, heavy cream, butter, onion, and garlic with roughly chopped baby spinach leaves. The texture is creamy and thick but not too sticky, and the most prominent flavors come from the parmesan cheese and spinach. Everything is cooked in a single pot on the stove and can be whipped up with just 15 minutes of cooking time. 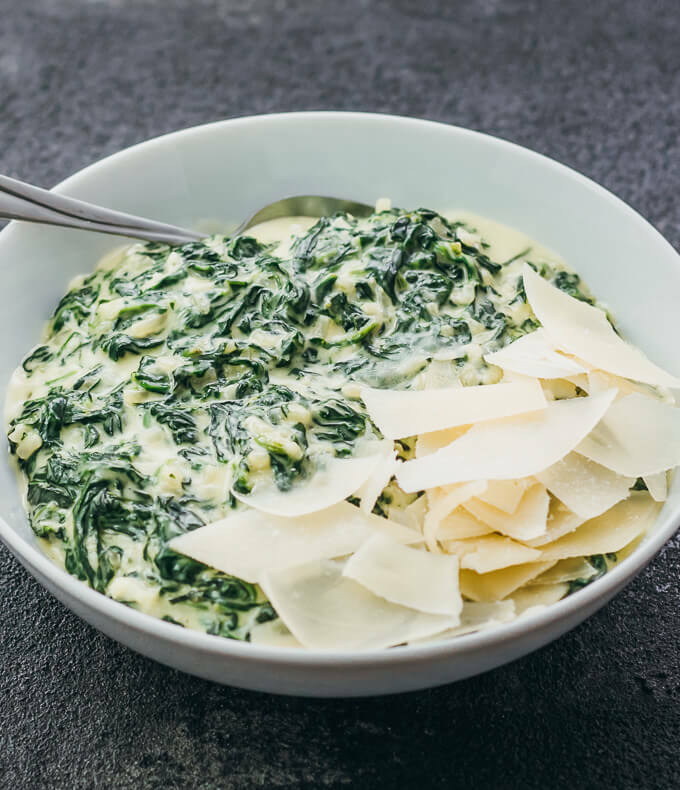 You can make creamed spinach a number of different ways — baked or sauteed, with various milk-based ingredients including cream cheese, sour cream, heavy cream, butter, milk, and various cheeses. 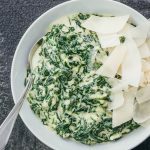 I chose to use ingredients that I had readily available, and in particular, I didn’t use cream cheese even though you’ll often find it in traditional creamed spinach dishes. Cream cheese tends to have more carbohydrates than many other alternatives (and it varies a lot by brand), and my tests show no loss in flavor or texture by omitting it. I prefer to prepare creamed spinach on the stove rather than in the oven, because it cooks very fast with multiple intermediate steps and it’s easier to monitor the sauce consistency when cooking on the stove. I also add garlic near the end of the recipe, after the sauce has simmered to my desired consistency. I prefer garlic to be slightly undercooked so that it has a stronger flavor, as raw garlic is much more potent than cooked garlic. I don’t find any need to season this dish with salt or pepper — it’s easy to get oversalted spinach, which is the worst, and will overpower the intrinsic flavors of the dish. If you have any shaved parmesan cheese handy, I recommend topping with it for additional cheesy flavor. If you’re trying out this recipe for Thanksgiving, you should absolutely also make these low carb companions: cranberry sauce with orange zest and mashed cauliflower loaded with bacon and cheddar. A delicious, comforting, and easy side dish of cheesy creamed spinach. Low in carbohydrates and ketogenic friendly. Add spinach to a large pot over medium-high heat. Cook until the spinach is wilted and most of the liquid released by the spinach has been simmered off, about 5 minutes, stirring constantly. Reduce to medium heat. Add butter and onions. Cook until the butter has melted and the onions are tender (if using fresh onions), about 5 minutes, stirring occasionally. Add parmesan cheese, stirring with the spinach until melted. Add heavy whipping cream and bring to a simmer over medium-high heat. Simmer for a few minutes until desired consistency is reached, stirring frequently. Reduce heat to low. Add garlic, stirring for a minute until incorporated. Season with salt and pepper to taste, if needed. Top with shaved parmesan and serve while hot. I have not been able to find Stouffer’s creamed spinach in grocery stores for over a year, but after making this recipe, I will stop looking. This is excellent! Perfect for someone on the Keto diet. yes I made it and it’s incredible. Making it again tonight. Awesome, thanks for the review Dan! Wonderful, I’m glad you enjoyed it a lot! Can you please tell me why anyone would make this extremely unhealthy dish that states one serving has 39 grams of fat with 27 of those grams being SATURATED???? Seriously, I love spinach, but this recipe is not for me or for anyone else who cares about their health. Not to mention the 150 MG of cholesterol. Yum, this was a great side dish. Thanks for sharing. Instruction 1 says: “Add spinach to a large pot over medium-high heat. Cook until the spinach is wilted and most of the liquid in the pan has been simmered off, about 5 minutes, stirring constantly.” Where does the “liquid” come from? Hi Peter 🙂 The liquid comes from cooking the spinach because the spinach exudes liquid as it cooks. I mention simmering off most of the liquid so that you don’t end up with a soggy creamed spinach. Let me know if this clarification doesn’t make sense. I’ll see if I can reword the instructions to make it more clear.